This is the train ride of the year. In fact it’s a magical train ride into yesteryear and it only happens once every year. Do you believe in holiday magic and that wishes really do come true? Well then get your Golden Ticket and receive a happy holiday bell when you ride the Railroad Express at Laws Railroad Museum and Historic Site. Come celebrate the holiday season with your kids (and your inner kid) during a day of old world charm and magical holiday train rides. Hop onboard the restored Death Valley Railroad Car with a host of angels and elves for the annual Railroad Express. 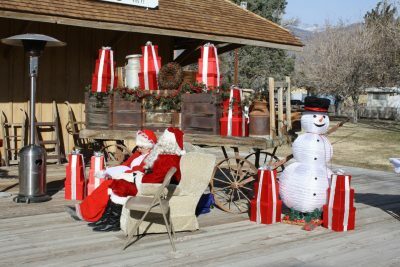 This festive family fun happens every second Saturday in December at Laws, near Bishop, for a day filled with joyful activities and live entertainment. There’s caroling and story telling, crafts and refreshments, and best of all, Santa and Mrs. Claus will be there to share the holiday spirit and give the gift of seasons past. 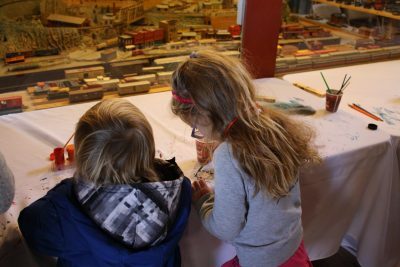 Laws Railroad Museum and Historic Site celebrates the rich history of this railroad and tells of a time when the railroad station was the heart of a bustling western town. Come experience it at the most joyous time of year. A mere six miles north of Bishop on US Highway 6, Laws Railroad Museum and Historic Site is not just another theme park. It is a beautifully preserved reminder of the small, once lively town of Laws and the railroad station it served. The narrow gauge railway that ran through this valley for 76 years from 1883 to 1959 was known as the “Slim Princess.” Until 1931 when the full length of US Highway 395 was paved the Slim Princess was a major means of transportation in the Owens Valley. The museum and extensive outdoor site has a section of track and working railroad cars in addition to many original buildings, salvaged and restored structures, train engines and cars, and thousands of weird and wonderful artifacts. It safeguards the memories and experiences of a not-so-long-ago era of railway magnates, miners, farmers, fortune seekers, high Sierra adventurers, and travelers who rode the Slim Princess. The museum is a window to the past that can be enjoyed by folks of all ages and all walks of life. 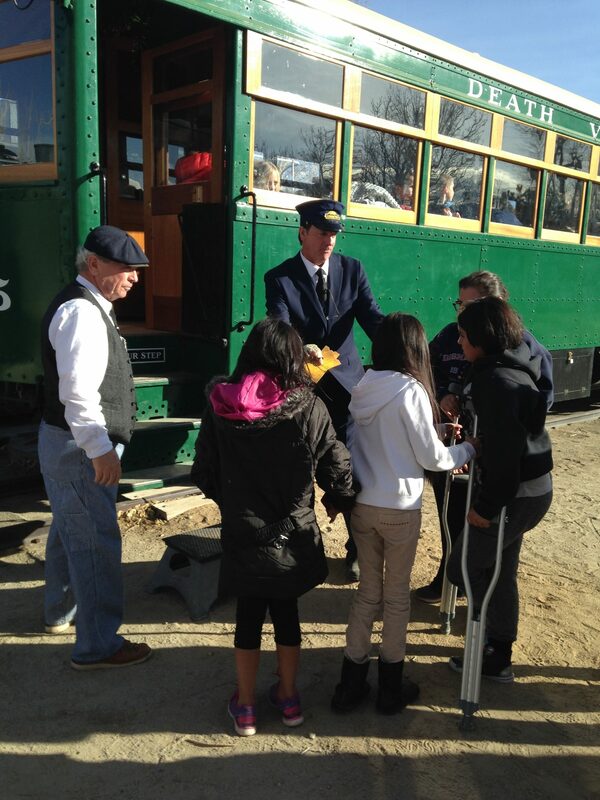 The annual Railroad Express is a journey back in time that can be experienced nowhere else. Train buffs will be enchanted by it. Historians will relish it. Kids will love it. Families will rejoice in a shared experience of hands-on learning and happy holiday activities. 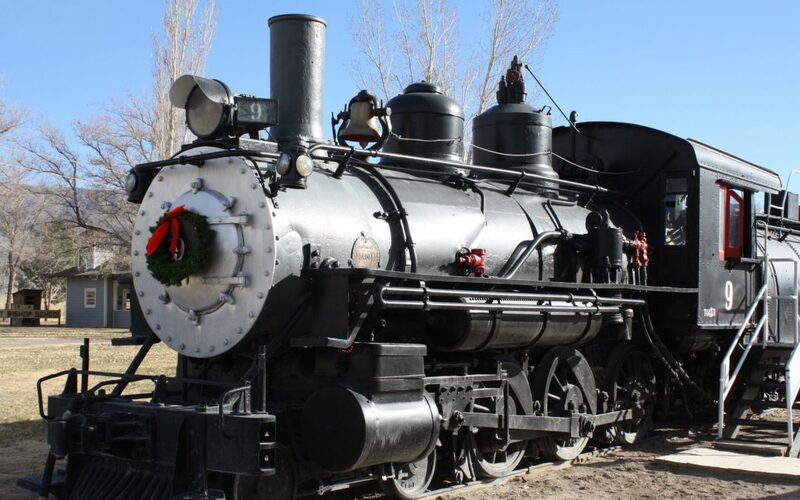 The holiday season is a magical season at Laws Railroad Museum and Historic Site. The Owens Valley is often warm during the day with a bright blue sky and sparkling sunshine. The mountains that rise high above the valley are covered with a blanket of pure white snow and offer a stunning backdrop to this enchanting place. The views from the museum site haven’t changed a bit since this railway town was built. Winter adds so much more to the railway magic. Remember to dress in layers as temperatures vary from inside to outside and can change rapidly at any time of day during winter. There’s always a good chance of winter wind, rain or snow any time so be prepared for seasonal surprises. 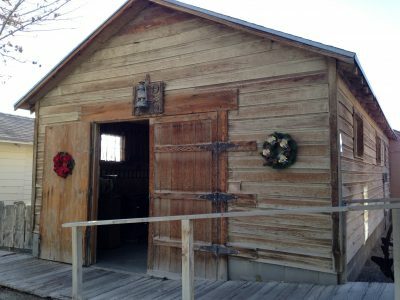 Start your holiday experience at the Bishop Visitor Center at 690 N. Main Street. Pop into the A-frame building at the corner of Main & Park streets to get maps and information about all the holiday happenings in Bishop. Tickets for the Railroad Express can be purchased in advance at the visitor center or at Laws on the day of the event. Admission is $7 for children ages 3-12, and $15 for adults and kids over 12. To get to Laws head north on US Highway 6 for six miles until you reach a sign for the museum at the intersection of Silver Canyon rd. Turn right and in a couple hundred yards turn left into the parking area for the museum site. Gates open at 10am and the holiday fun lasts until 4pm. Train rides are limited so get your tickets early and don’t miss out on this magical holiday journey. The railroad museum is open daily year round. Sumer hours are 9:30am – 4pm and train rides on the old Death Valley Brill Car No. 5 are scheduled to run on holiday weekends from Memorial Day weekend through Labor Day weekend. Amateur photography, video, and filming during the Museum’s normal operating hours are always welcome. Any other photography or filming requires special permission. The use of any sort of aircraft such as drones, radio controlled airplanes, helicopters, etc. is subject to rules and regulations from the Federal Aviation Administration because of the proximity of the Bishop Airport. Dogs are not allowed on the grounds of the museum site. Read more about the history of the Slim Princess in a previous blog here.